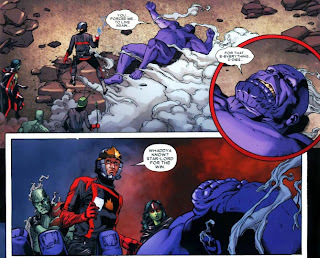 Back Issue Ben: Guarding the Galaxy, Part 20: Cancelled! War of Kings had once again left the universe in danger, with a rip in space and time called the fault threatening the fabric of existence. 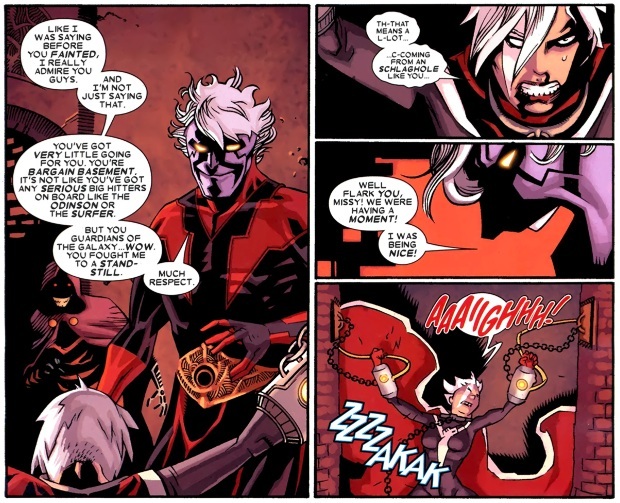 The Guardians of the Galaxy had succeeded in stopping the fault from expanding, but lost the soul of Adam Warlock in the process, as he was corrupted into becoming his evil future self, the Magus. 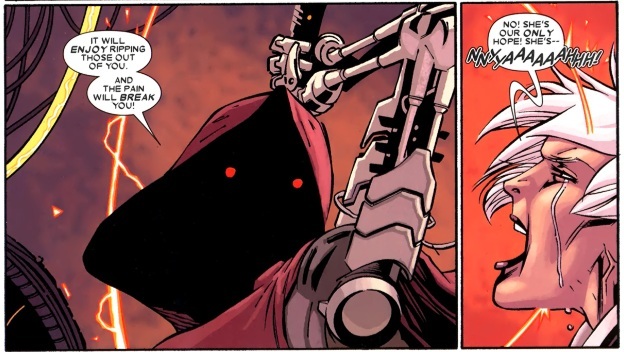 Many team members died at the hands of the Magus, before Star-Lord reluctantly killed the Magus to end his reign of terror. The Guardians once again came into conflict with the Universal Church of Truth, winning a high stakes battle against the religious zealots. But, unknown to the Guardians, the Magus still lives, and has their believed dead teammates in captivity. 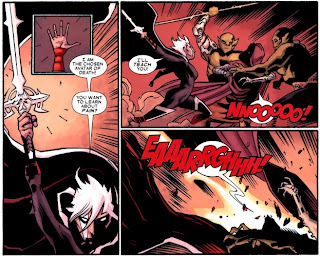 Phyla relives the fight with the Magus from weeks before, including her death at the end of her own sword. She witnesses the remainder of the fight as a spectral figure floating above it, where she is soon joined by Mantis, Cosmo, and the rest that perished in battle. The Magus was too weak from closing the fault to fight Star-Lord and the others, so he was using his powers to alter perception, and to make Star-Lord think that he had won by killing him. The Magus joins them in his spectral form, and takes them all off to a nearby templeship. Now, in the catacombs of Sacrosanct, the Magus interrogates a captive Phyla. 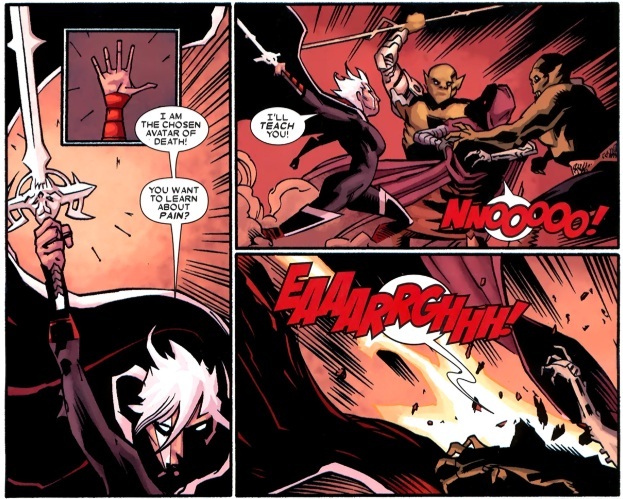 He taunts her about taking on the role of the avatar of death, not to save Moondragon as she claims, but to show everyone that she can’t be ignored. Magus plans to bring the creatures of the fault into their universe, where they can share their gift of deathless life. Meanwhile, the Guardians are attending the rededication of the newly reformed galactic council, as both representatives and as security for the event. They are eventually joined by Crystal as a representative for the Kree, as well as Blastaar, representing the Negative Zone. Back on Sacrosanct, the Church interrogator continues to torture Phyla, in an attempt to convert her. He threatens to use a whip on her that erases beloved memories. During this, she is drawn away to the psychic plane to meet with Cosmo, Mantis, and Major Victory. Time is running out, as they may not be able to withstand conversion for much longer. They convince her to try and use her bond with Moondragon to contact her psychically. Back at the Galactic Council meeting, Moondragon collapses from Phyla’s psychic scream, at the same time an assassination attempt on Blastaar fails. The assassins did not fire mere bullets though, as creatures spring forth from the projectiles and attack. Phyla is able to successfully warn Moondragon of the Magus, and finds the strength to break free from her physical bonds. She summons forth her sword, kills the guards, and frees the others. My brain thoughts: I wasn’t a big fan of the switching back and forth in art styles from Wes Craig to Walker, but I think I’ve come to appreciate Craig’s style a little bit more. It is more cartoony than Walker’s art, but it fits the book and my sensibilities as a reader more and more as the series goes on. 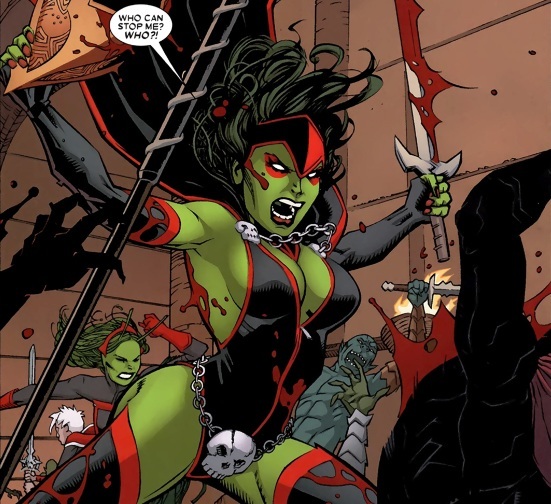 Phyla, Cosmo, Mantis, Major Victory, and Gamora fight their way out of the catacombs of Sacrosanct. The Universal Church of Truth sends their black knights and shock troops to stop them, but nothing can stop them. During the battle, Phyla receives a vision from Maelstrom, chastising her for failing to kill the avatar of life, Adam Warlock, but offering her a chance to make amends. The Matriarch arrives, and blasts Phyla in the back with a concentrated blast of belief energy. 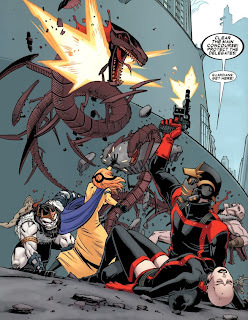 Meanwhile, Star-Lord and the rest try to hold off the creatures while also tending to the unconscious Moondragon. Rocket arrives to blast the creatures to pieces. 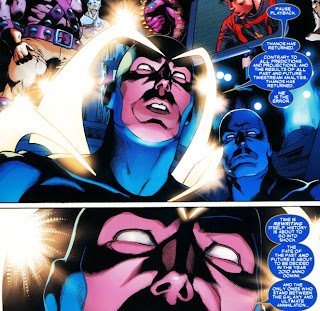 Blastaar argues that the Guardians have no place on the council, as they are nothing more than vigilantes. They work around this by using Groot’s status as King of Planet X to secure their place in the meeting. 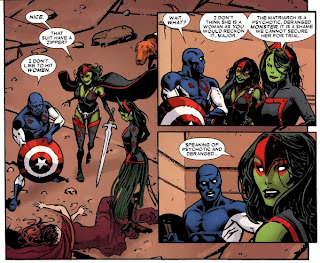 With the council in session, Star-Lord slips away to check on Moondragon, who is already being visited by Jack, Drax, Bug, and Rocket. She finally summons up the strength to talk, and tell them that Phyla is alive, but so is the Magus. 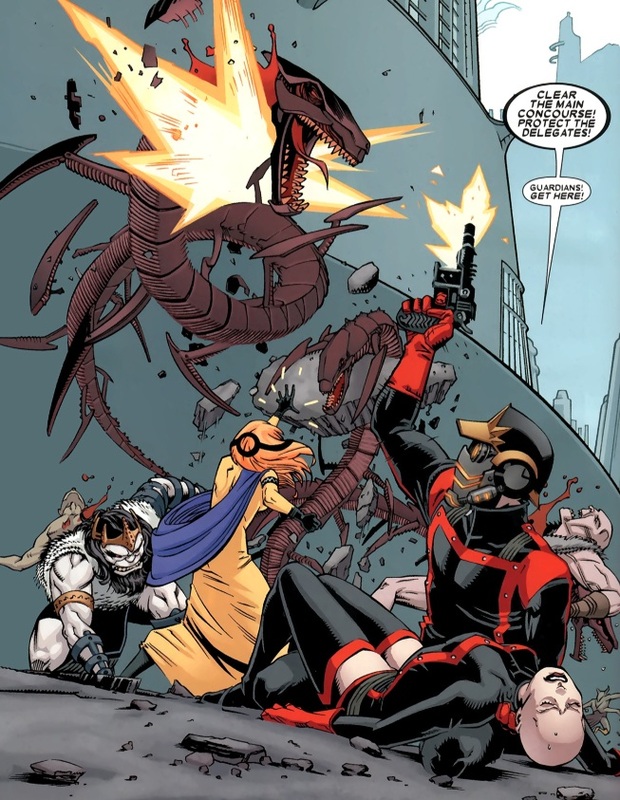 Mantis and the rest try to withstand the furious assault from the Matriarch, before Major Victory finally knocks her out with a shield to the head. Phyla slipped away during the battle, led by Maelstrom to the location of the mysterious cocoon (as seen in previous issues). Maelstrom convinces her that inside is the individual that can even the cosmic balance, and bring life and death back into harmony. 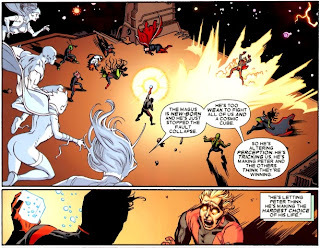 Believing this to mean that Adam Warlock is inside, Phyla slashes open the cocoon, only to find out that it is not Adam Warlock, but Thanos, who, with a devastating blast of energy, incinerates Phyla-Vell. My brain thoughts: Finally, the secret of the mysterious cocoon is revealed. 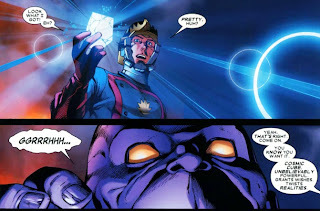 I know I read these comics before, but I had no recollection of Thanos being in that cocoon. What a joyous surprise. It appears that Phyla might be dead for real this time, and that is a shame. She was much more interesting and entertaining as a character than Moondragon. The original ‘70s Guardians of the Galaxy celebrate the restoration of the proper future, but Starhawk is not convinced that the timestream has been fully stabilized. He meets with the Council of the Guardians of all Galaxies. 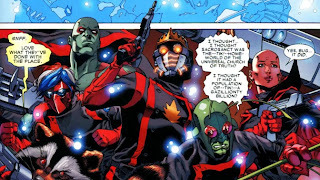 They debate and recount their investigation into the anomaly in the timestream, that led them back to the formation of Star-Lord’s version of the Guardians. While everything appears to have been fixed, and that all timelines have been restored, they fear that it is just the lull before a renewed storm. 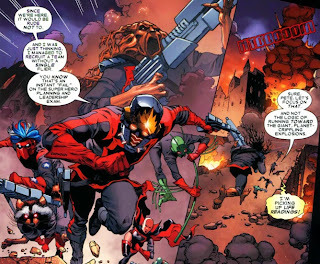 In the present day, Star-Lord leads the Guardians into Sacrosanct, to rescue Phyla and the others they had thought dead. They arrive to find the place in flames and ruin. Drax can feel the taint of a familiar presence. An explosion sends the team running to investigate, which runs them directly into Gamora, Cosmo, Mantis, and Major Victory. The two teams celebrate being reunited (with particularly touching greetings between Star-Lord and Mantis, and Cosmo and Rocket). Moondragon asks about Phyla, and Gamora regretfully informs her that she was the first one killed by him. Before anyone can ask who the “him” is, a rabid Thanos comes rampaging in, his body literally on fire. Thanos is in a feral and mindless state, and the team does their best to avoid his attacks, except for Moondragon, who charges him, mad with grief. 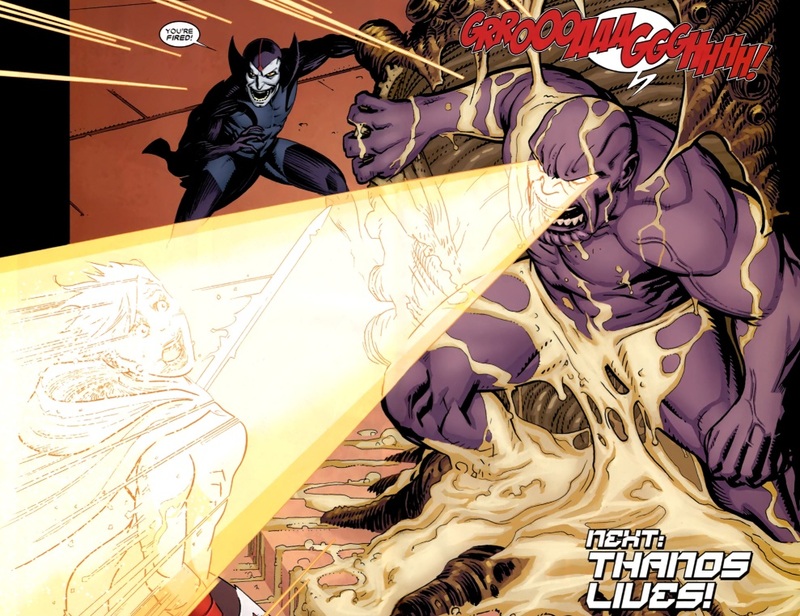 The team attempts a few fruitless attacks against Thanos, but he is invulnerable and unstoppable, so they pull back. 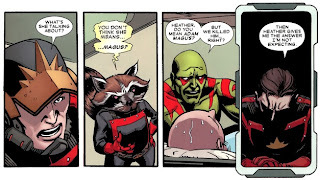 Drax refuses to believe this, and rushes in to attack. While Thanos is distracted, Star-Lord approaches him with the Cosmic Cube given to him by Kang. He had thought the Cube’s power depleted, but since everything that happened was all a trick by the Magus, it still has some power left. Enough power for one last shot. Back in the future, the Starhawks pause the Guardians debrief logs that they have been monitoring to consider the events that just happened in that distant past. 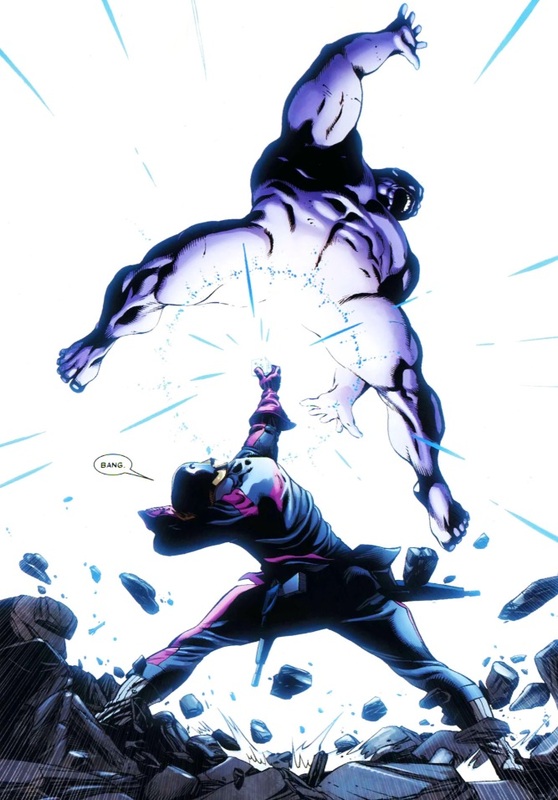 Thanos is the error in the timestream. My brain thoughts: That final speech got my juices flowing. Star-Lord and the Guardians deciding the fate of the universe. Abnett and Lanning were able to tie in the ongoing questions about the time stream really well here at the end. My final brain thoughts: Thanos, charbroiled Phyla, memory whips, bullet bugs, and the fate of the universe. And with that, the Guardians of the Galaxy series ended. 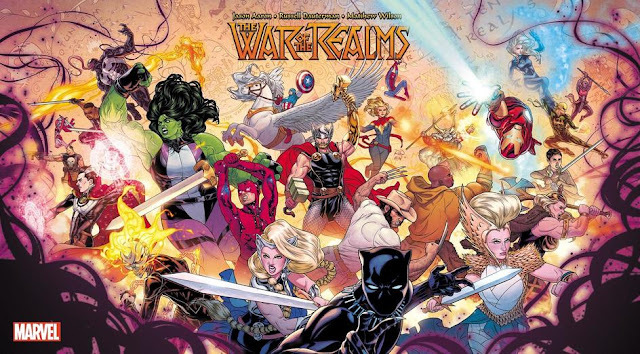 The ongoing narrative spanning years worth of mini-series and events would continue into The Thanos Imperative, bringing the saga of most of these characters to an end. Come back next week, for the pulse-pounding conclusion (It's a two-part conclusion, though, so it doesn't end next week. 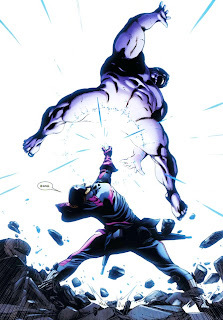 -Duy) to an entire universe full of stories that began all the way back in Thanos, Drax, and Annihilation. Who will live, who will die, and how much will I cry at the answers to those questions?